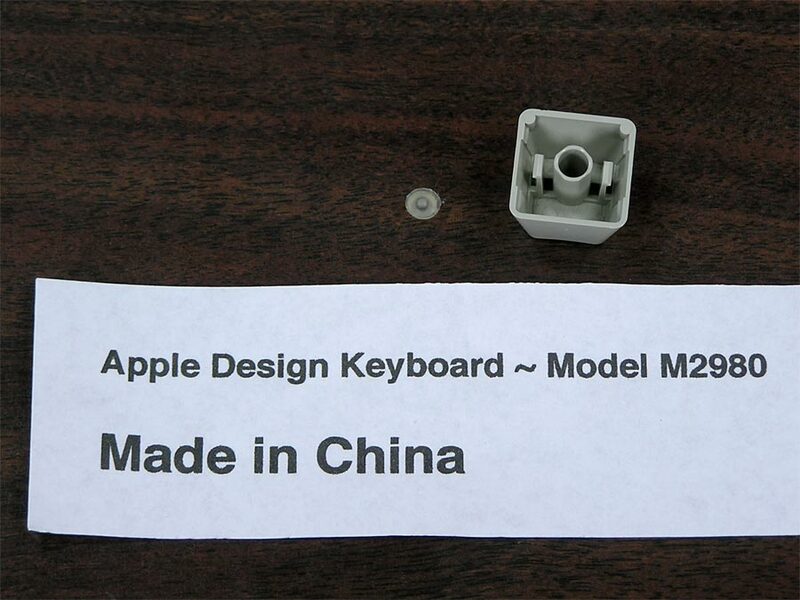 These Key Caps will only work on the China version of the Apple Design Keyboard, M2980. 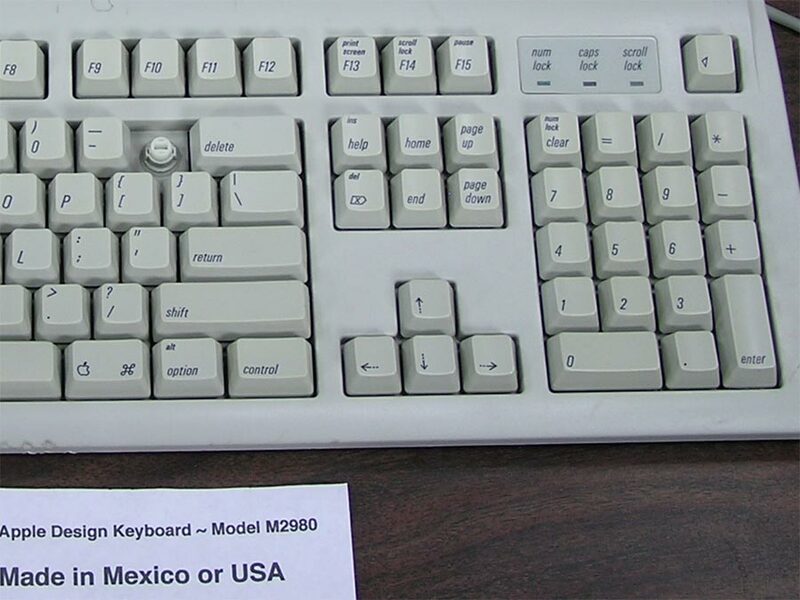 For M2980 keyboard identification, click here. For other keyboard parts for this version only, click here. The first picture above is for illustration, the last two photos are the actual keys available on this page. Coloring ranges from Light to Medium or Severe. 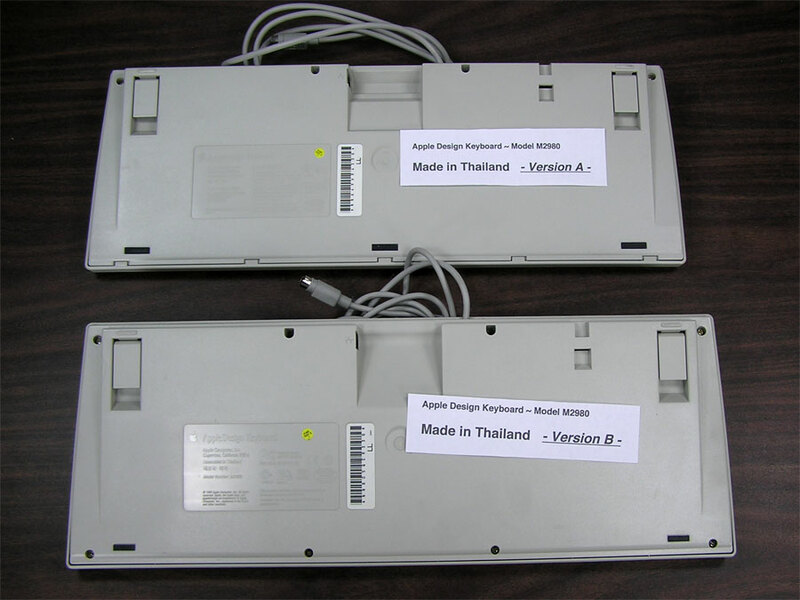 The stabilization wires will be included with the following keys: shift (l), shift (r), delete, return, space, keypad 0, and keypad enter. 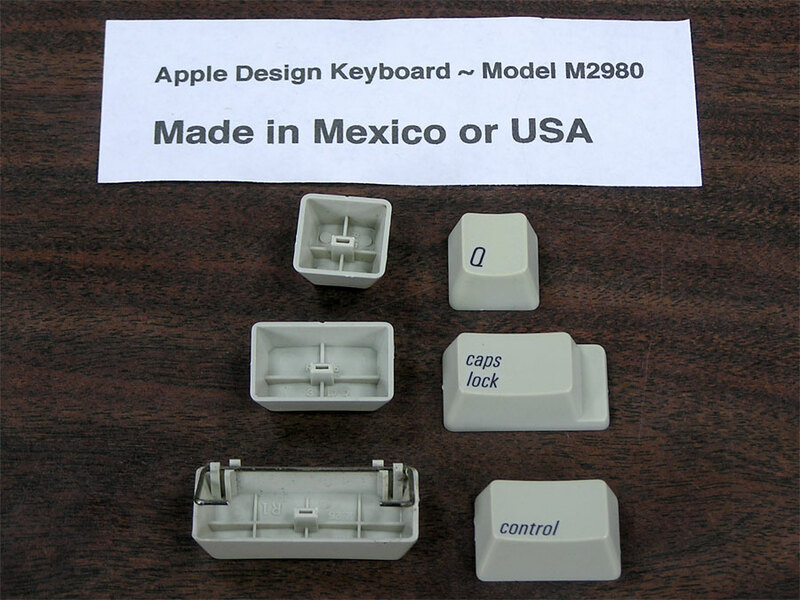 These Key Caps will only work on the Mexico or USA version of the Apple Design Keyboard, M2980. 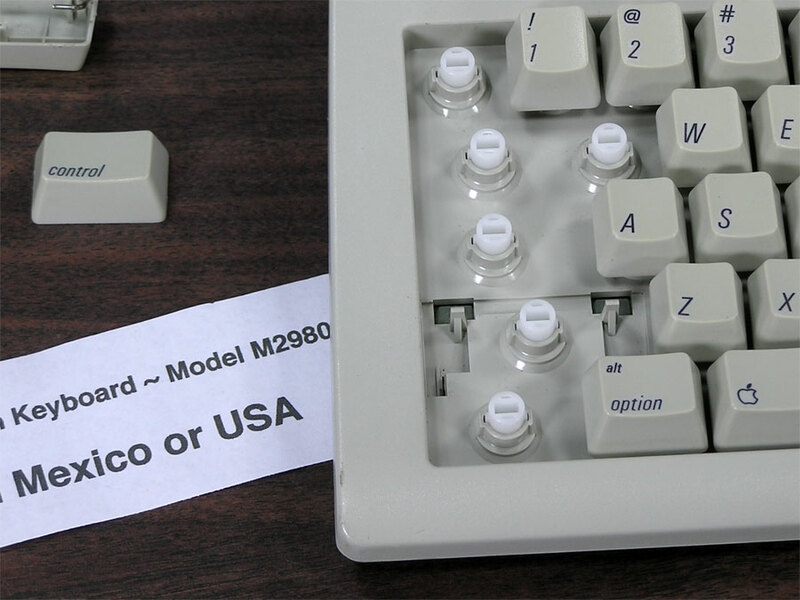 For M2980 keyboard identification, click here. For other keyboard parts for this version only, click here. The first picture above is for illustration, the last two photos are the actual keys available on this page. Coloring is Light. 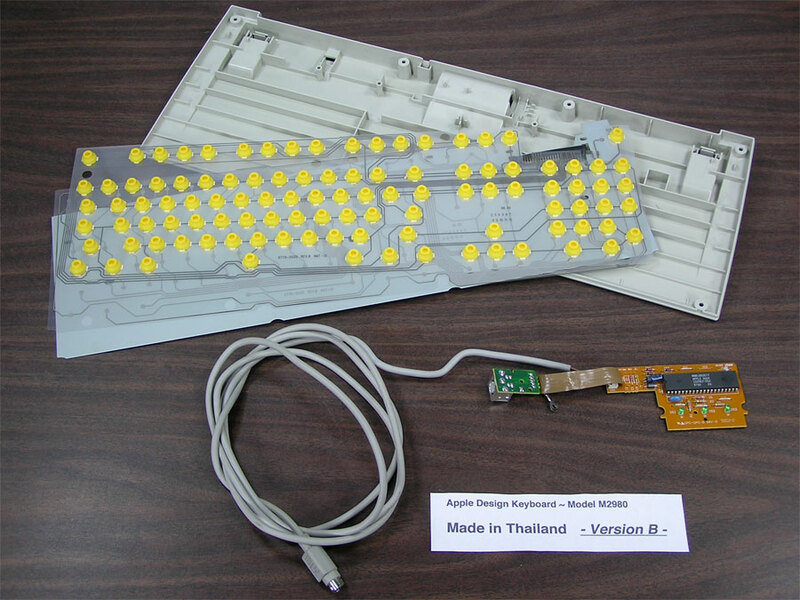 The stabilization wires will be included with the following keys: shift (l), shift (r), delete, return, space, keypad 0, and keypad enter. The first picture above is for illustration, the last two photos are the actual keys available on this page. Coloring is Nice. 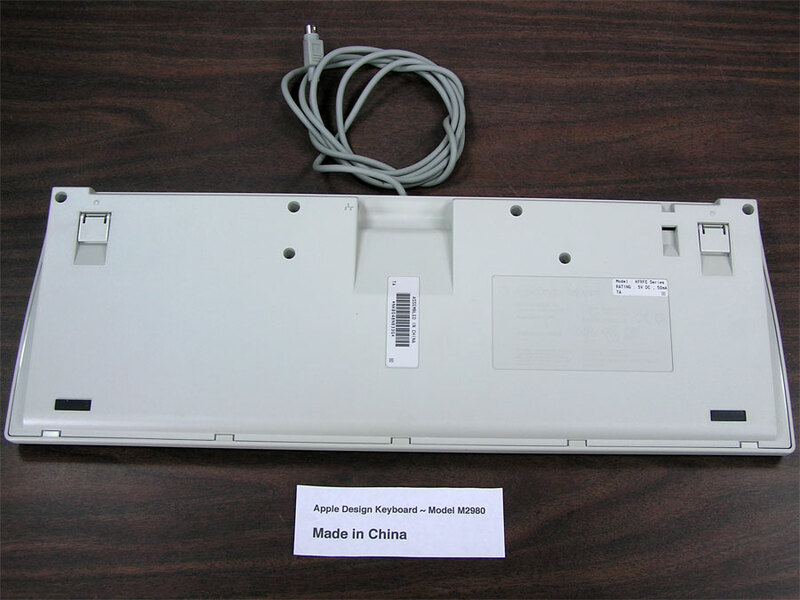 The stabilization wires will be included with the following keys: shift (l), shift (r), delete, return, space, keypad 0, and keypad enter. 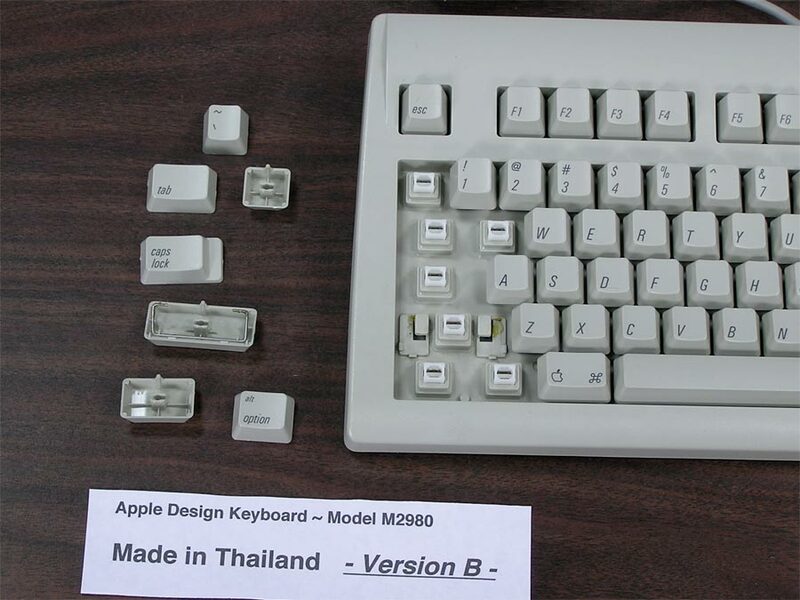 These Key Caps will only work on the Thailand Version A of the Apple Design Keyboard, M2980. 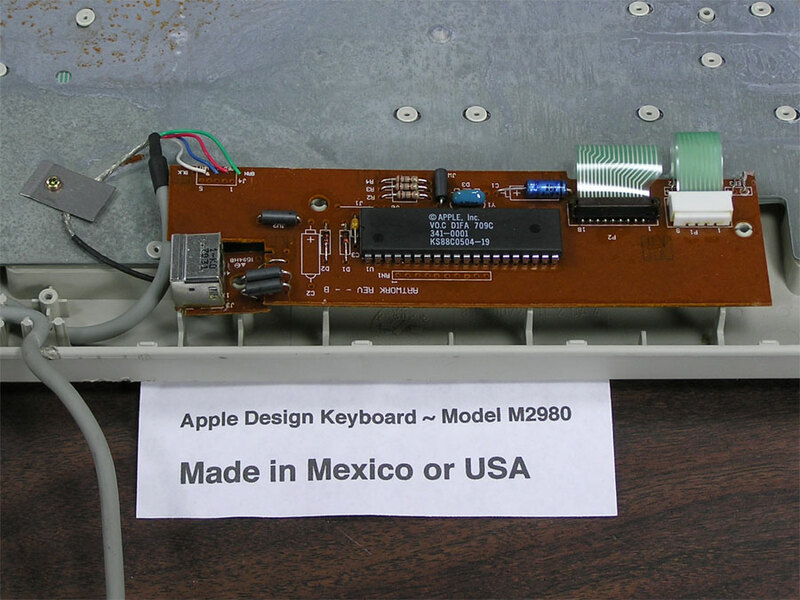 For M2980 keyboard identification, click here. 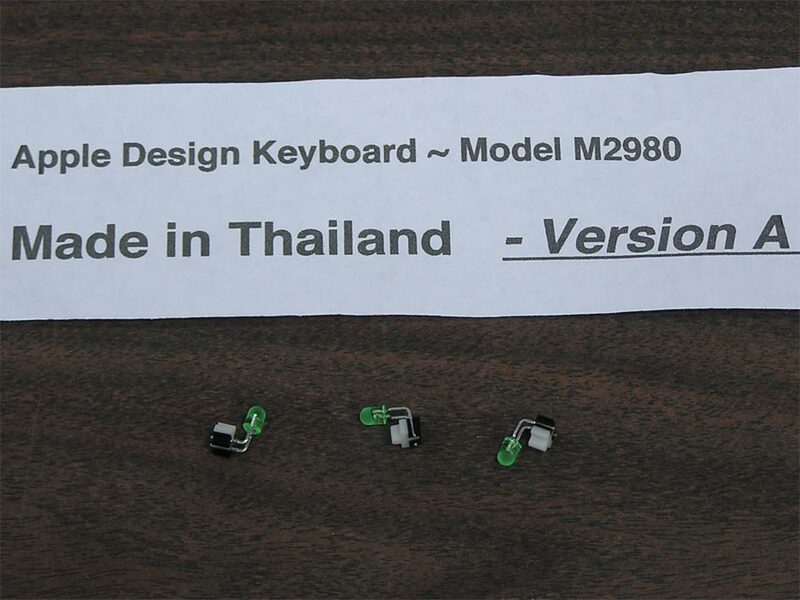 For Thailand keyboard identification, click here. 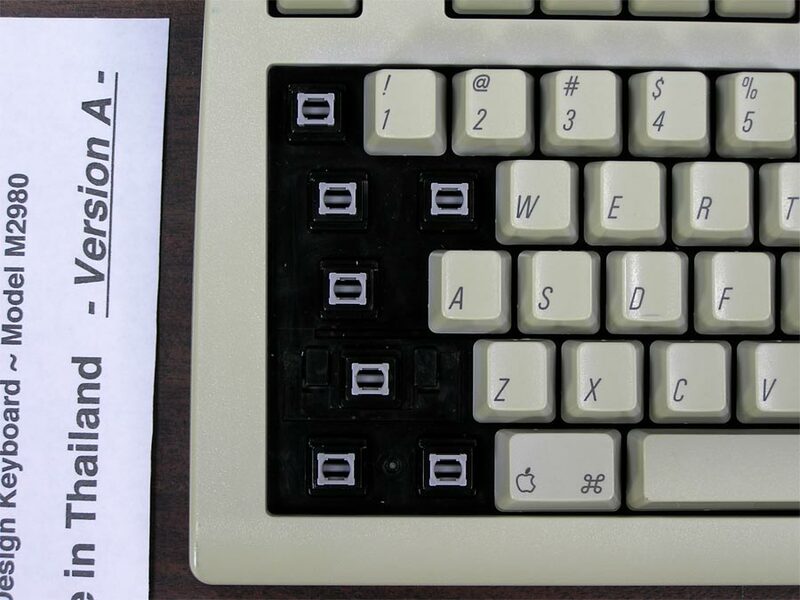 For other keyboard parts for this Version A only, click here. 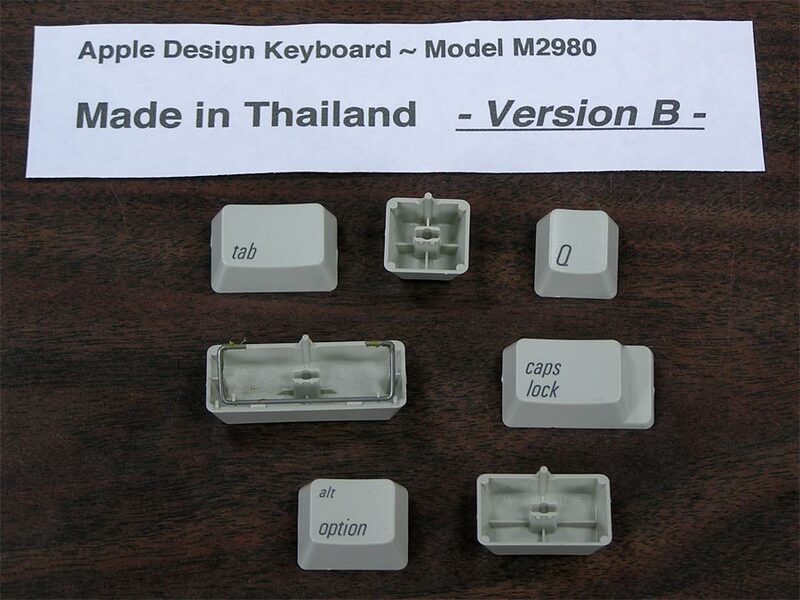 These Key Caps will only work on the Thailand Version B of the Apple Design Keyboard, M2980. For other keyboard parts for this Version B only, click here. The first picture above is for illustration, the last three photos are the actual keys available on this page. Coloring is Light, the keys on the far left are sunburned on the side and/or bottom (Severe). 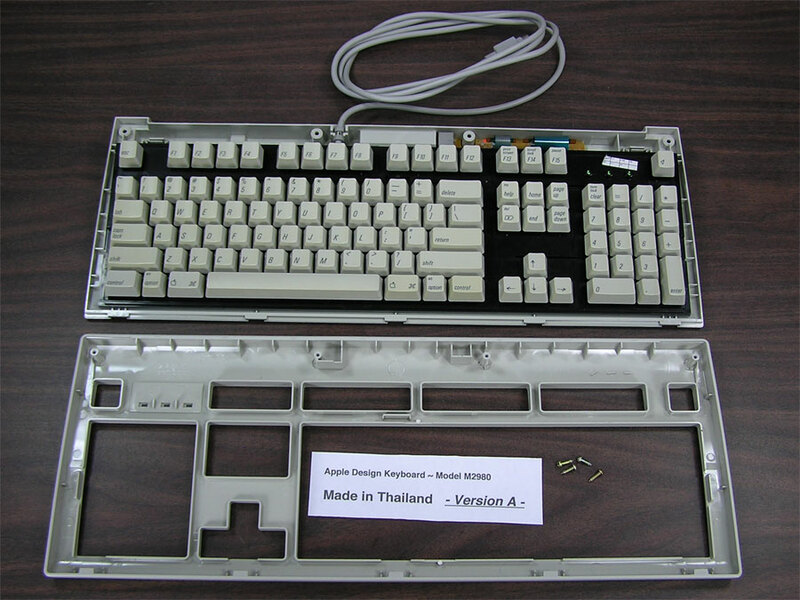 The stabilization wires will be included with the following keys: shift (l), shift (r), delete, return, space, keypad 0, and keypad enter. The first picture above is for illustration, the last two photos are the actual keys available on this page. Coloring is Severe. 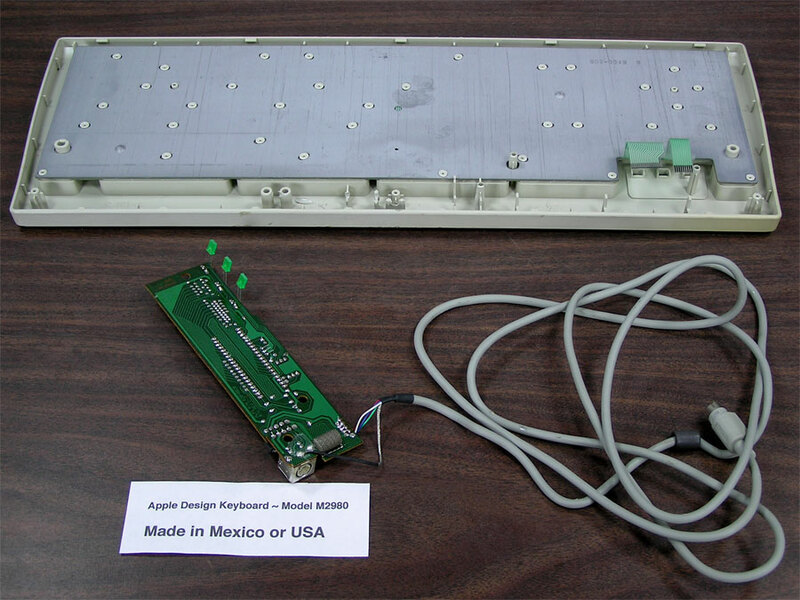 The stabilization wires will be included with the following keys: shift (l), shift (r), delete, return, space, keypad 0, and keypad enter. 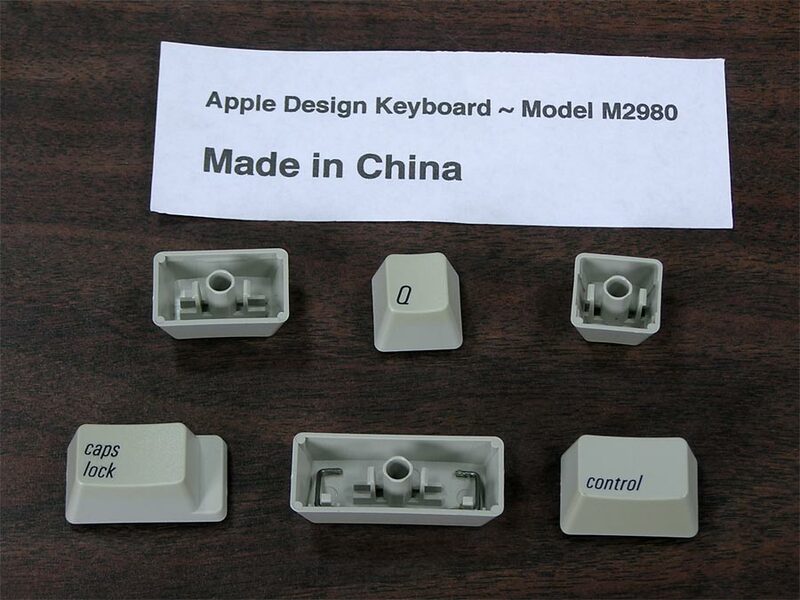 Made in China Version (Assembled or Manufactured). 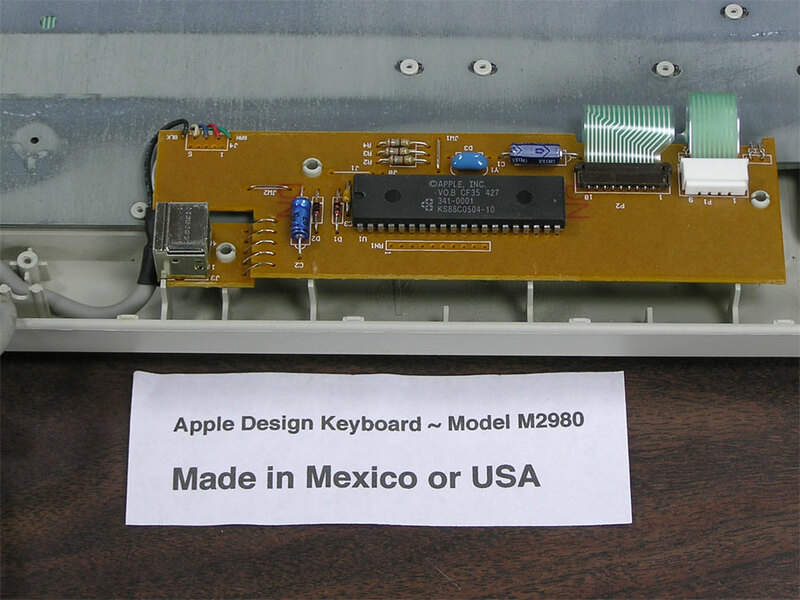 For M2980 keyboard identification, click here. Looking at the bottom, this version features short, narrow flip down feet (2). Long, wide rubber feet (2). Stamped label on right side. 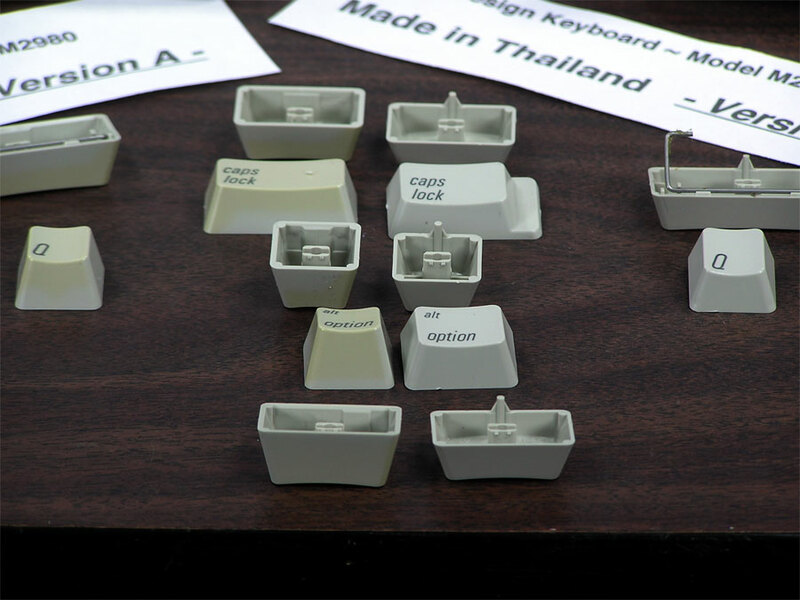 Key caps have a large round post underneath with two plastic legs with hooked ends. There are 6 screws on bottom case. 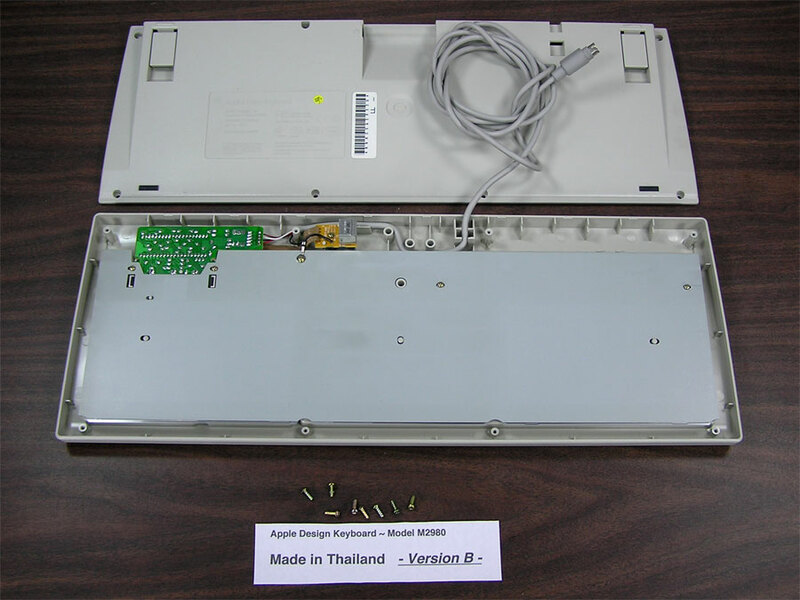 Upon removal of top case, the backplate/membrane assembly is screwed onto the bottom case with 3 screws. The controller board is screwed (6 screws) on to the backplate/membrane assembly, but also has a wire that runs between the two that is soldered on both ends. The backplate/membrane assembly is screwed together with 39 screws. 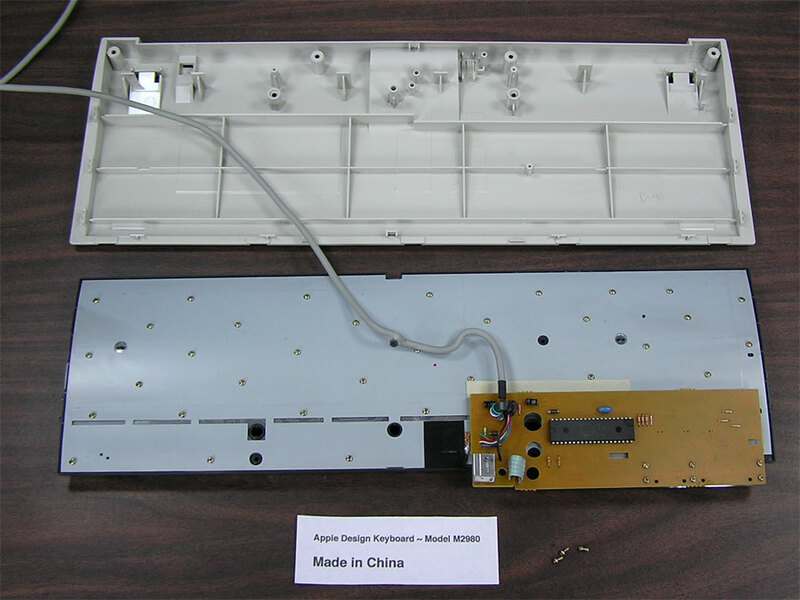 The backplate assembly is disassembled from the bottom side – screws are up. First off is a metal plate with the controller board soldered to it by a wire. Then there are two membrane layers. Up first is the membrane where the lines run between the “keys” horizontally. 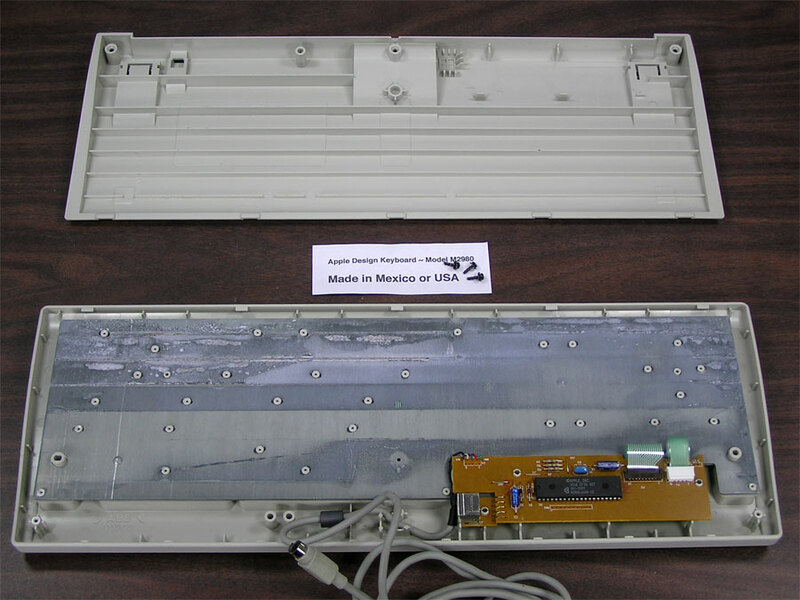 The bottom membrane layer has lines that run vertically between the “keys”. Next are the 105 separate domes or polydomes that sit inside each “key” hole. Last is the black plastic keycap base where the caps snap into it from the other side. 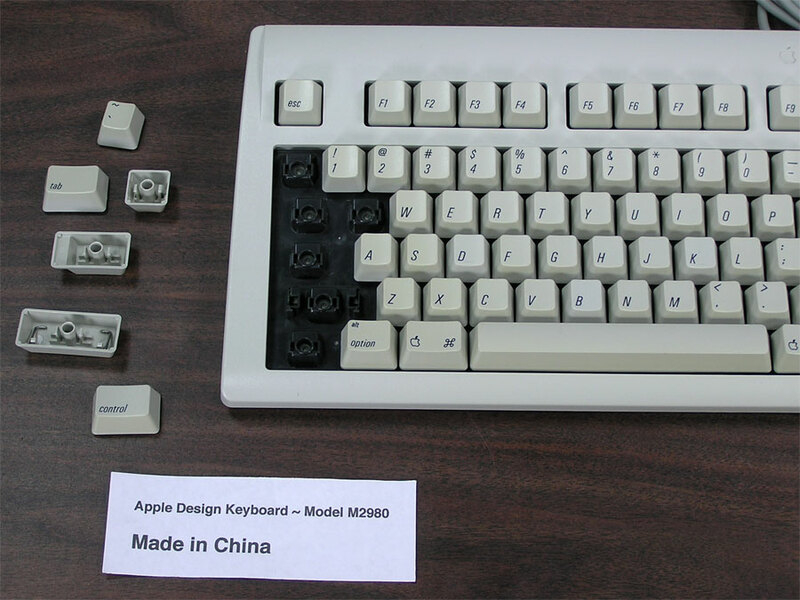 Note that the photo of a single keycap has a small flexible, round shape next to it. 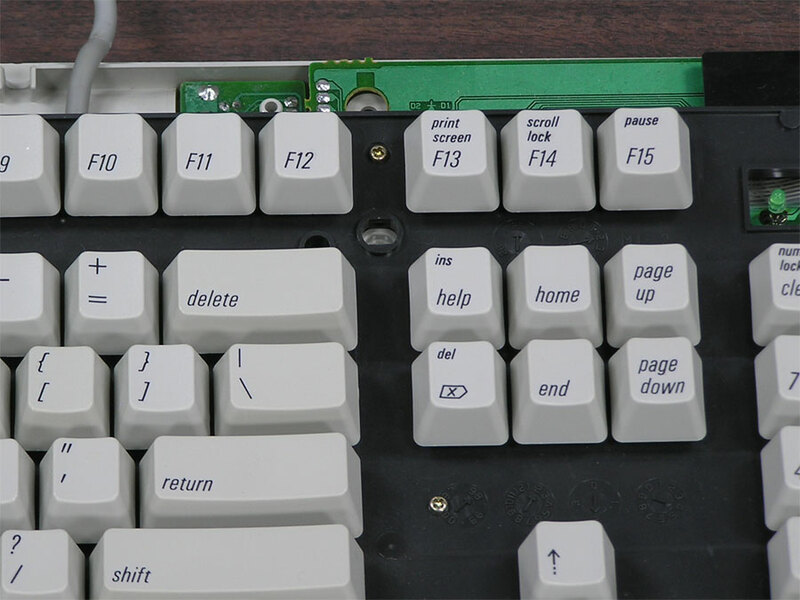 With enough use, these keys can end up causing a cookie cutter effect on the domes below the key caps. 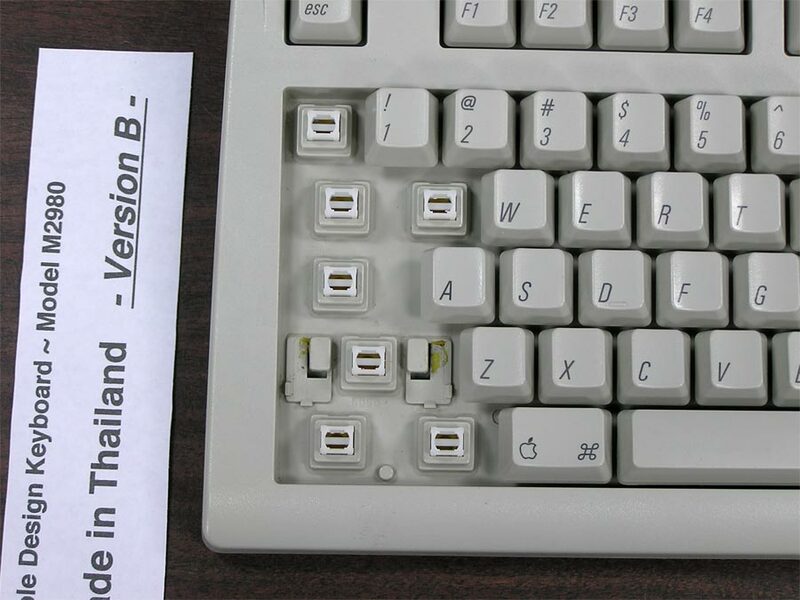 If pressed hard enough times, the keycap will no longer come back up. While still being secure, it will just rest in the hole and the dome below is now in two pieces. If you remove the key cap, the center of the dome may be stuck in the round hole in the bottom of the cap. The good news is that the domes can be replaced individually, as needed. 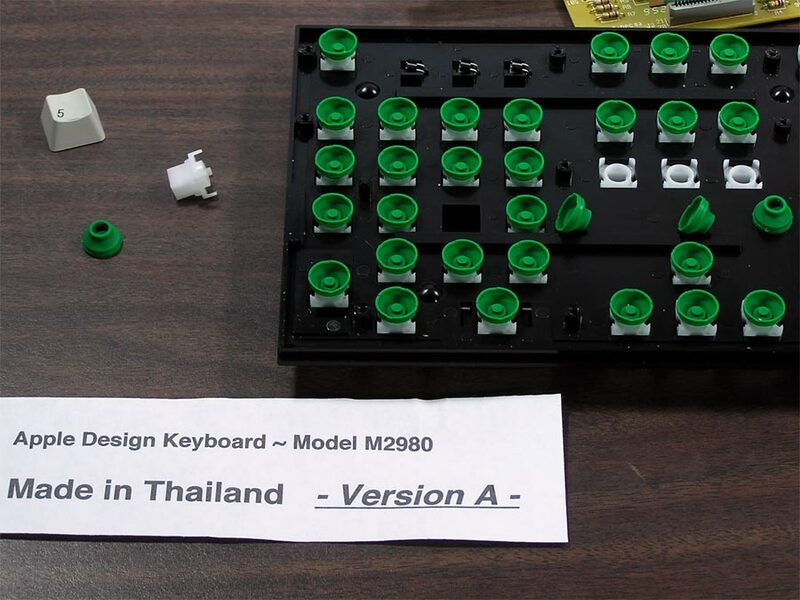 Parts will be selectable below if they are available, key caps are found here. Photos above are for illustration only. 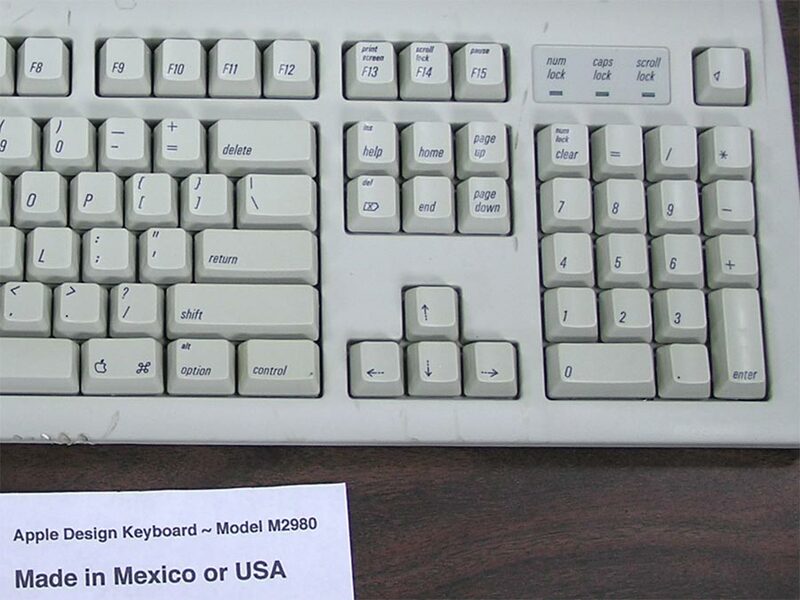 The specific keyboard available for parts has some severe discoloration. The top, bottom and flip feet are Severe on the left side of top to almost Light on the right side. The sides are flipped while looking at the bottom of the case with severe discoloration on the right side. *The controller board and both membrane layers are available inexpensively if interested, as there is an issue. 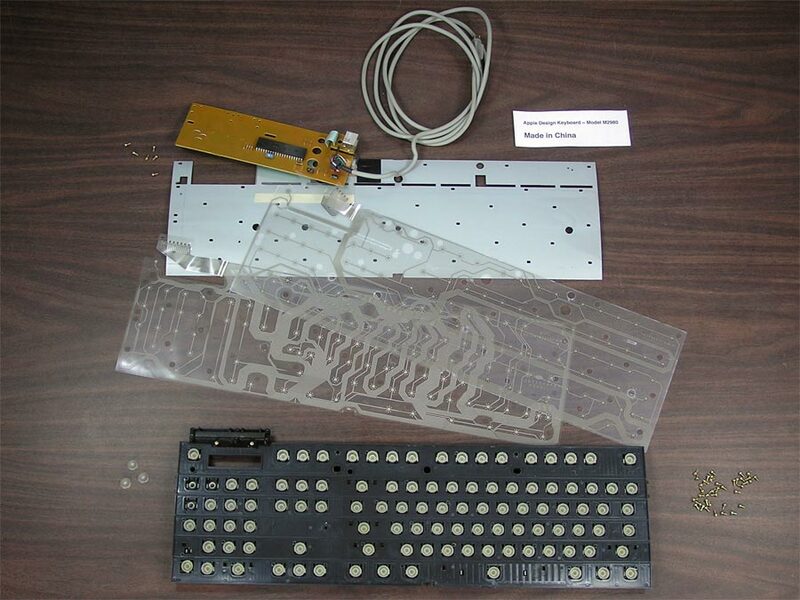 The following key presses did not work: F3, 3, equals, e, right bracket, d, c, keypad dot or period. The membranes may simply have to be cleaned, or they may be okay and the controller board is defective. 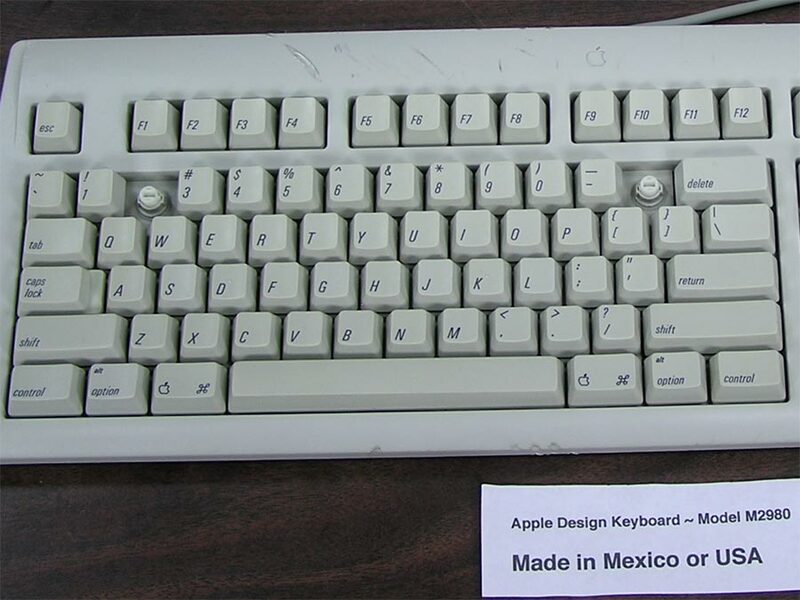 Made in Mexico or USA Version (Assembled or Manufactured). 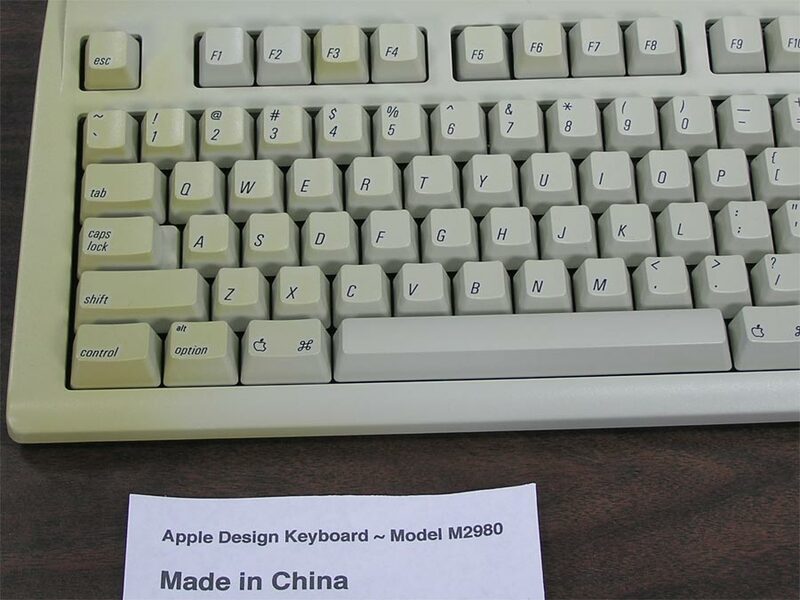 For M2980 keyboard identification, click here. The bottom of this version features short, wide flip down feet (2). Square rubber feet (2). Stamped label on right side. 3 screws on bottom case. Upon removal of bottom case, the backplate/membrane assembly is secured to the top case by plastic rivets. 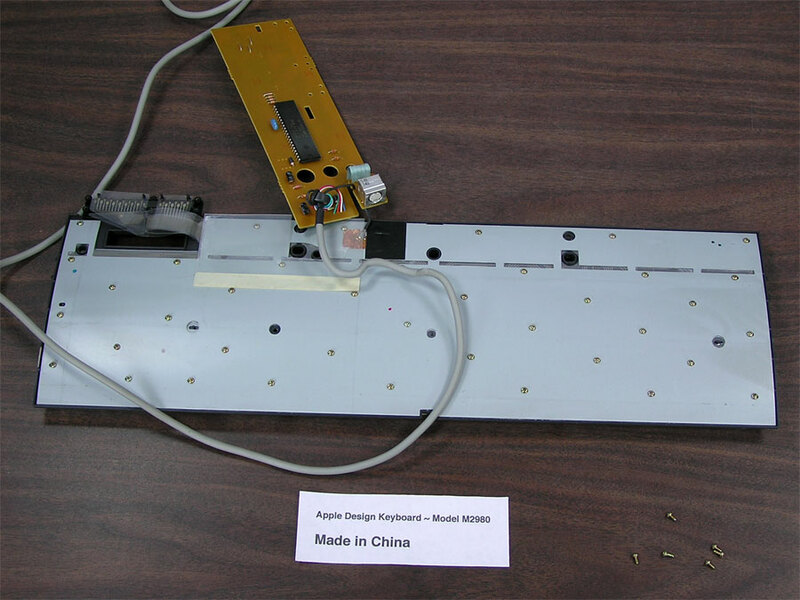 The controller board sits on plastic posts which you squeeze together to remove. The cable may or may not be secured with a bracket and screw. This bracket is used if your ground wire is bare – see photos. What’s left is the backplate/membrane assembly fastened together to the top cover with plastic rivets. 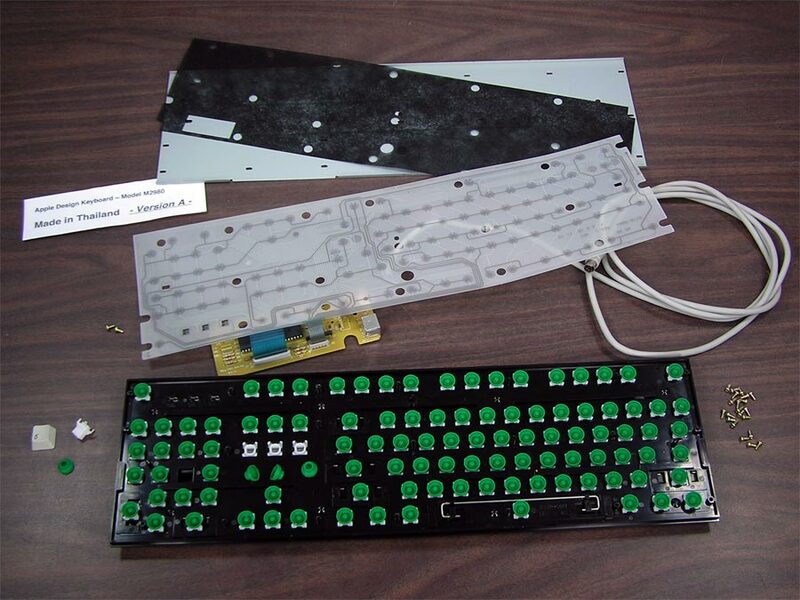 Further disassembly may render your keyboard impossible to use again. 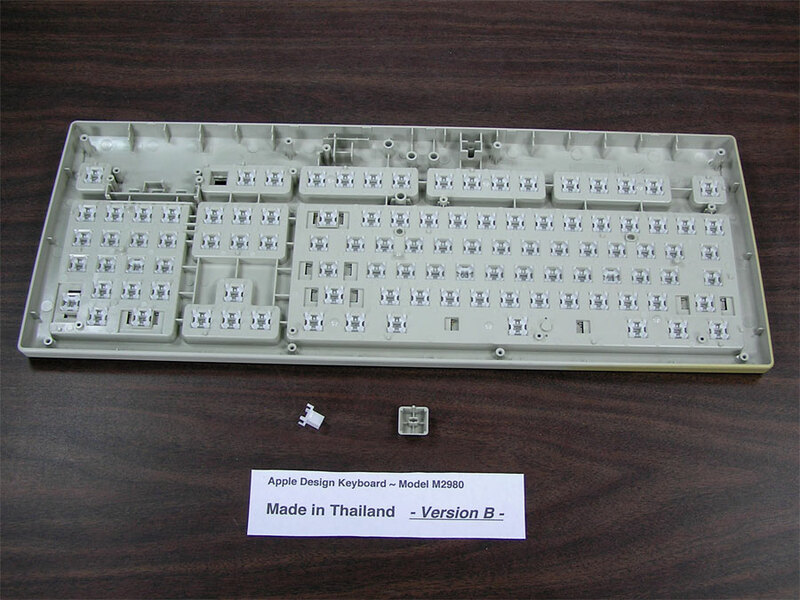 Parts will be selectable below if they are available, key caps are found here (Nice) or here (Light). 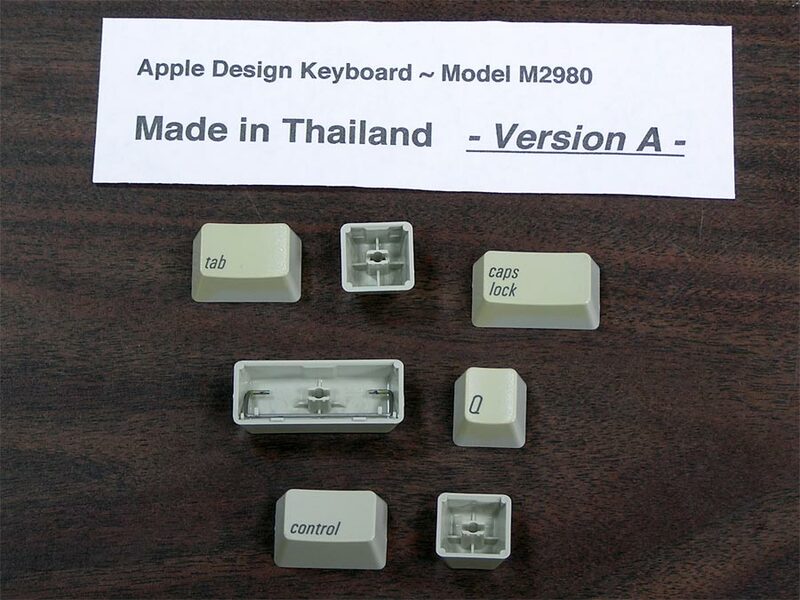 Made in Thailand Version (Assembled or Manufactured). 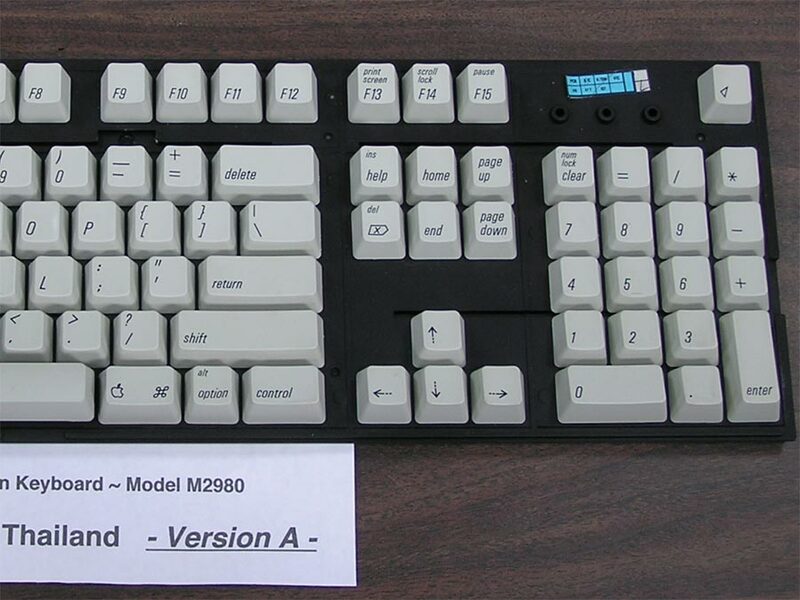 For M2980 keyboard identification, click here. 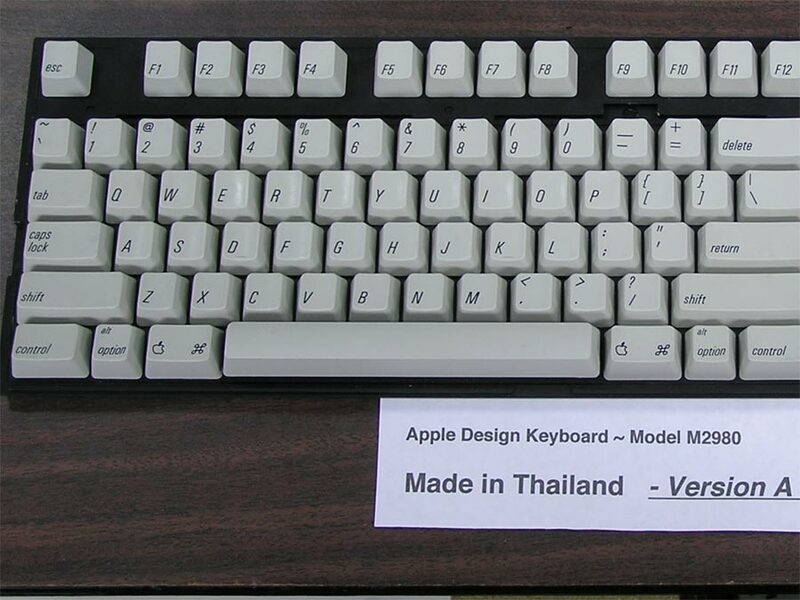 There are two Thailand versions of this keyboard. Both feature long, narrow flip down feet (2). Stamped label on left side. Parts are not interchangeable. 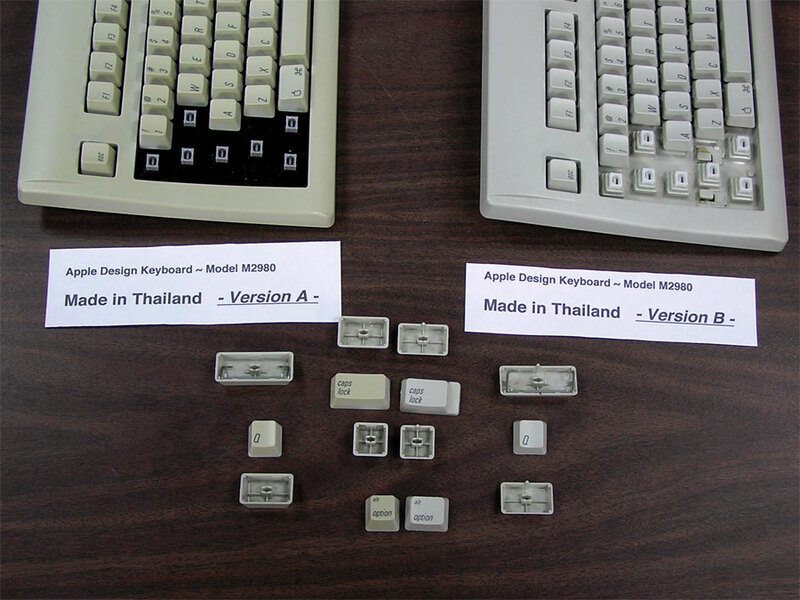 More information on the Thailand versions available here. 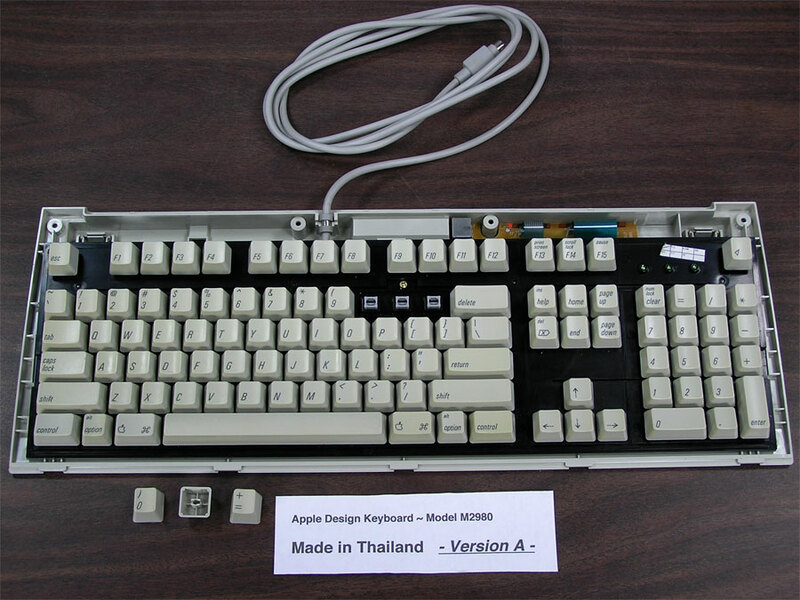 This Thailand Version (A) has 4 case screws and gray or white key posts in a black base. Long, wide rubber feet (3). Remove case screws from bottom. Turn over and remove top case. 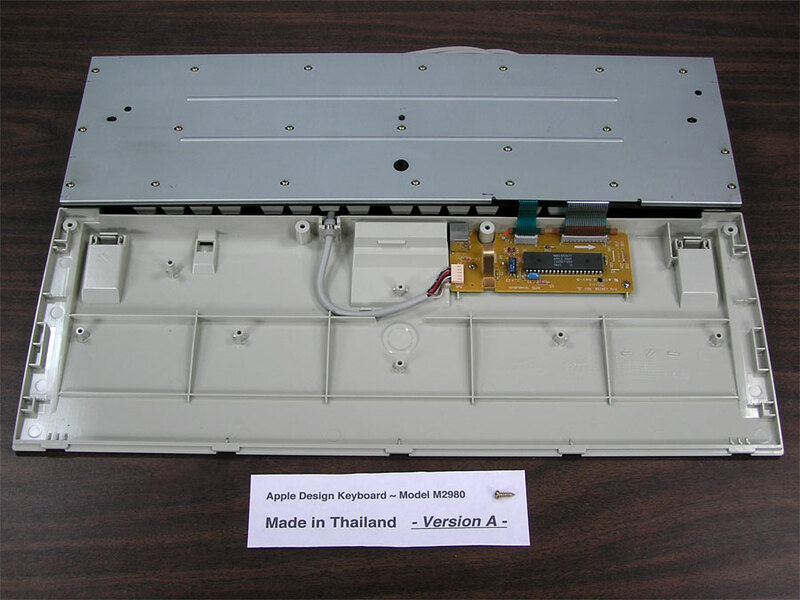 There is 1 screw holding the backplate/membrane assembly to bottom case. Controller board is fastened with 2 screws. There are only 21 screws holding the backplate assembly together. It separates into the metal plate, a felt layer, a dual membrane layer revealing 105 domes. 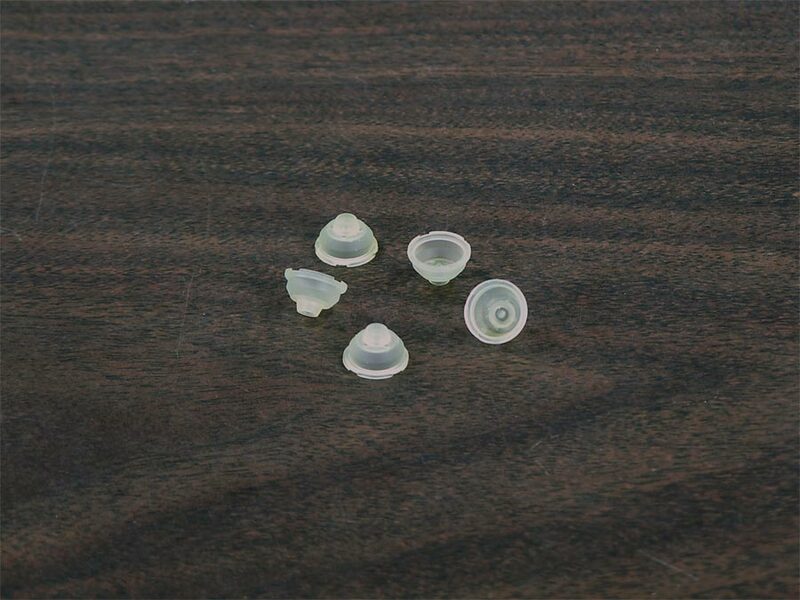 Under each dome is a hard plastic plunger that the keycap fastens on to the other side. 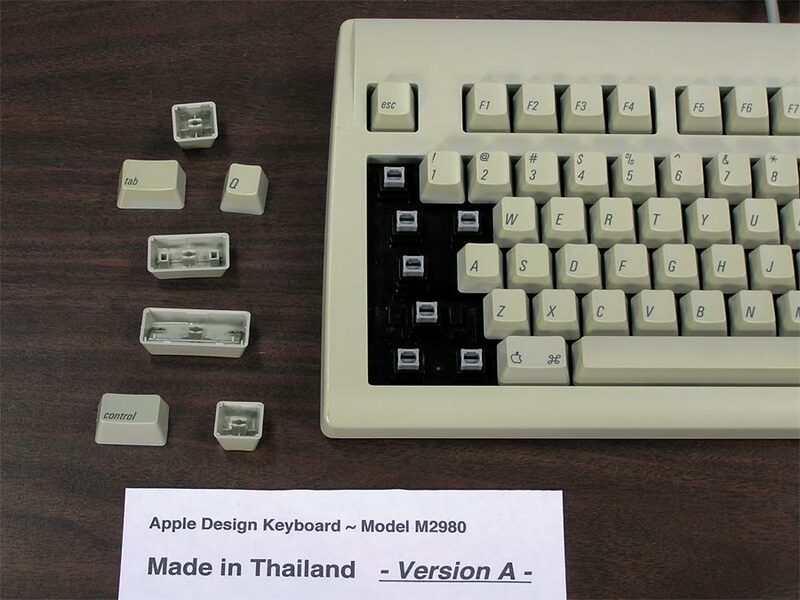 Parts will be selectable at the bottom of this page if they are available, key caps for Thailand Version A are found here. Asterisk* means that I have yet to figure out how the cables come out of the controller board. Please check before ordering. Photos above are for illustration purposes only and not the case parts you will receive. 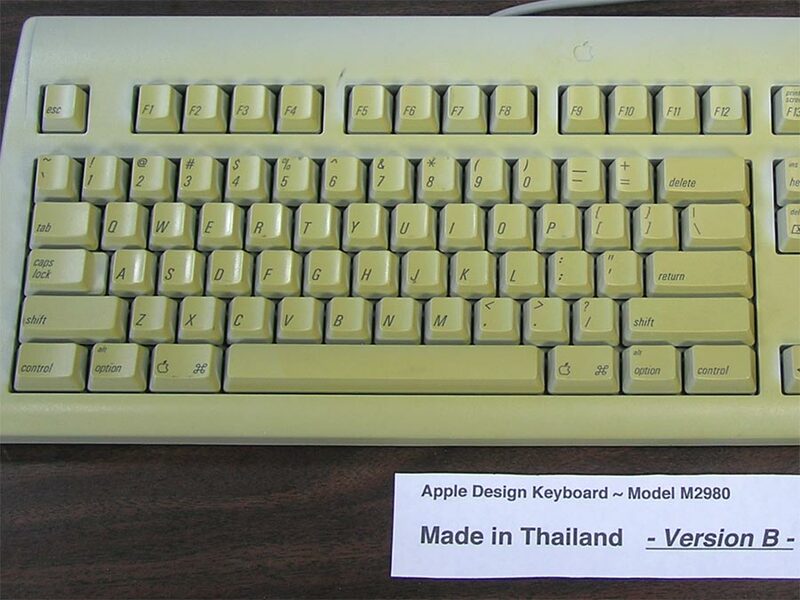 The only parts keyboard available for this version has Nice coloring on the plastic. Nice Top Case (there is 1 scratch towards the top). Nice bottom case. Nice flip feet. Was in 100% working condition, but the end of the cable is deformed. 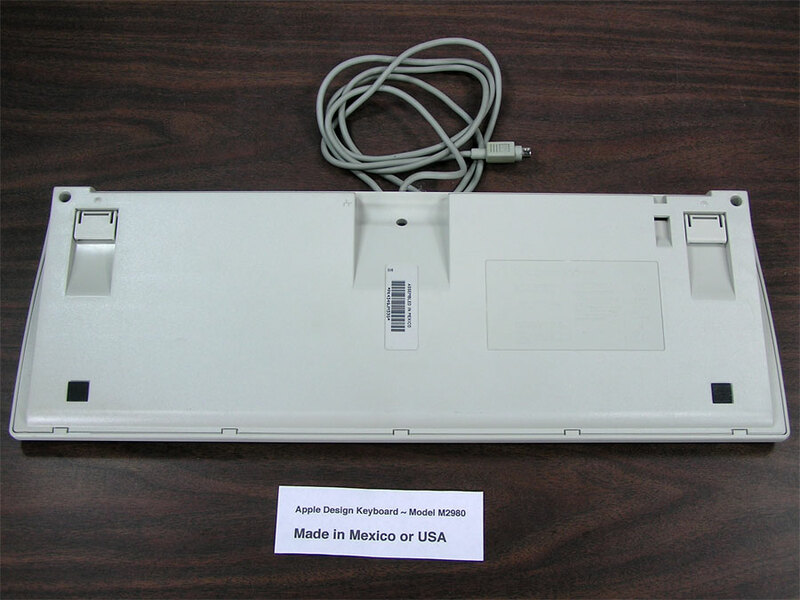 Contact me if you are interested in the dual membrane/controller board and (deformed, but working)cable. 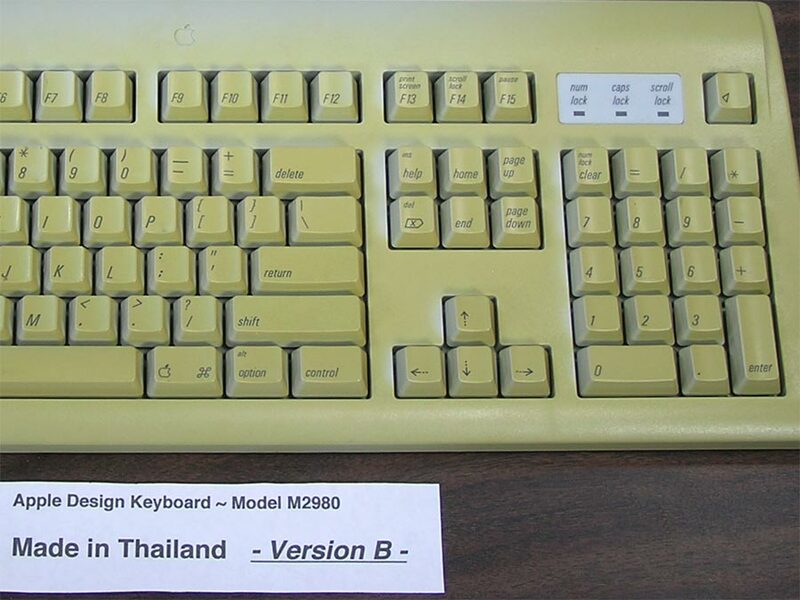 There are two Thailand versions of this keyboard. Both feature long, narrow flip down feet (2). Stamped label on left side. Parts are not interchangeable. 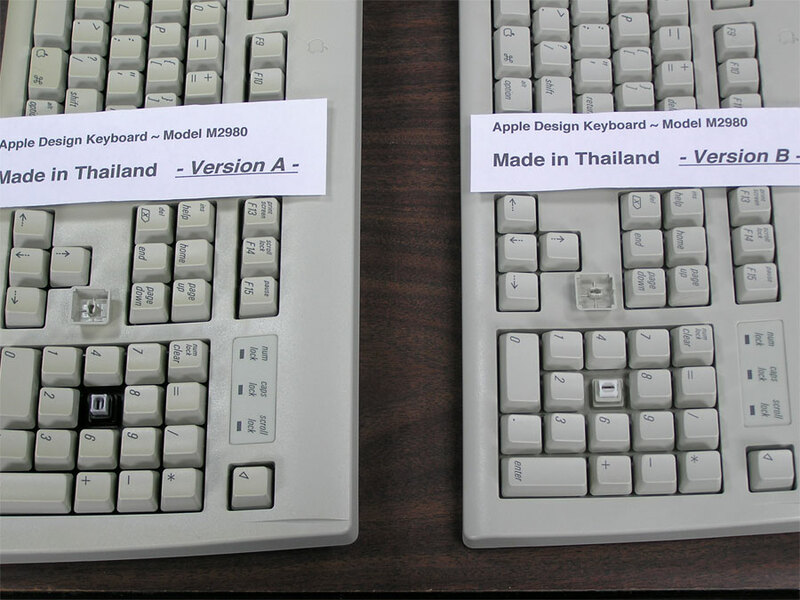 More information about the Thailand versions available here. 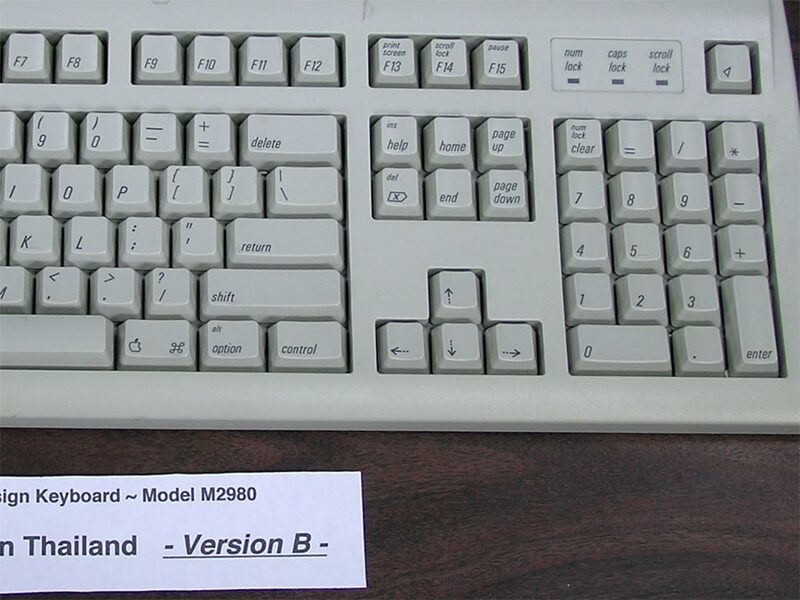 This Version (B) has 8 case screws with white key posts in a white base. Long, narrow rubber feet (2). Removing the 8 screws from the bottom case lets you remove the bottom case. The backplate/membrane assembly is screwed to the top case with 5 screws. 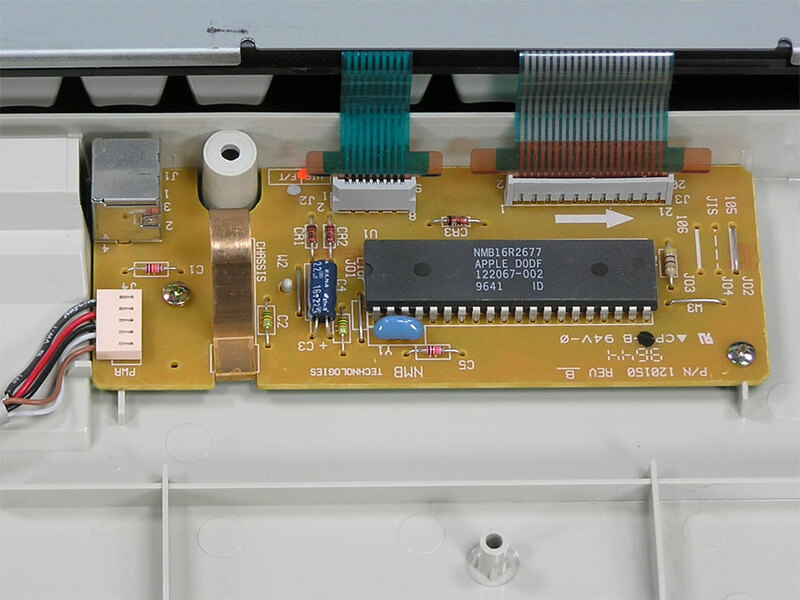 The metal backplate then comes off along with a membrane layer and dome membrane layer revealing the controller board and cable and underside of the top case. There may or may not be 2 screws on the controller board and 1 screw in the ADB port board. 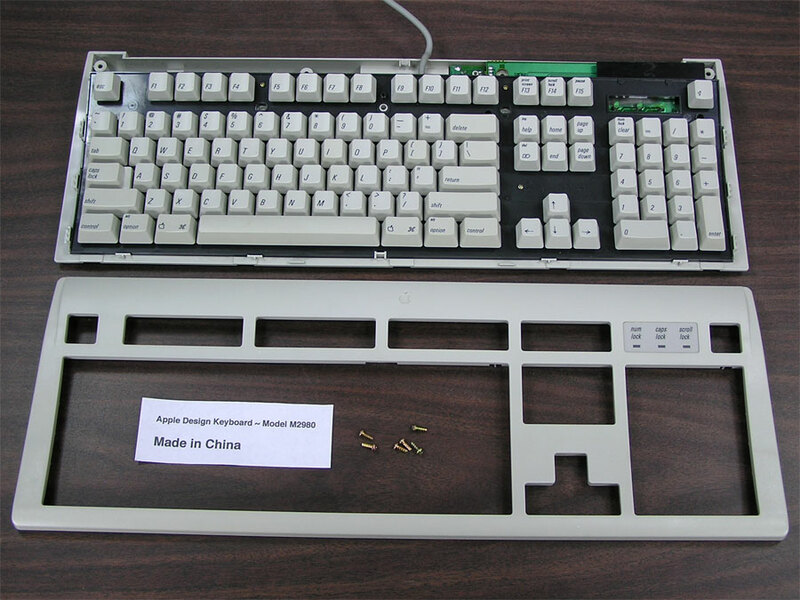 If you have not removed the keycaps, you will see the underside of the top case populated with white plastic plungers. 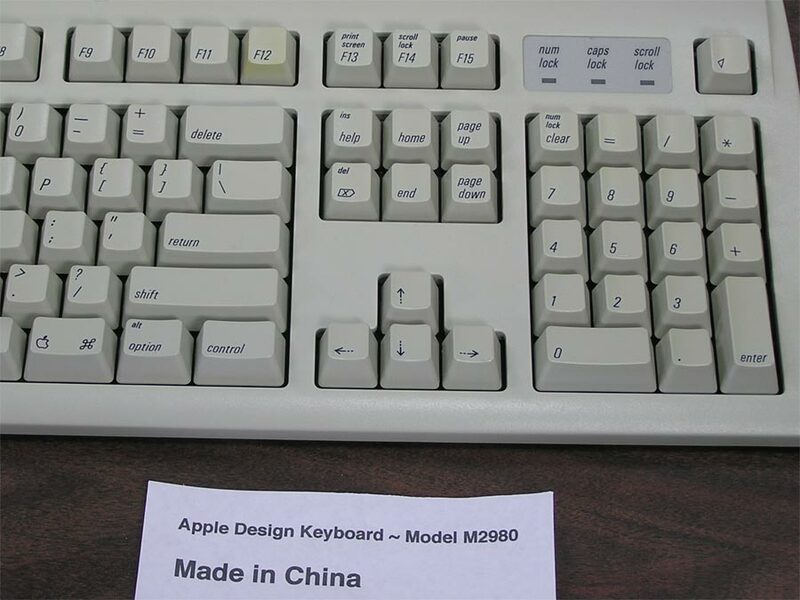 If you have removed the keycaps, then be careful. There is nothing holding the 105 plungers in place and they will fall out when the top cover is turned over. 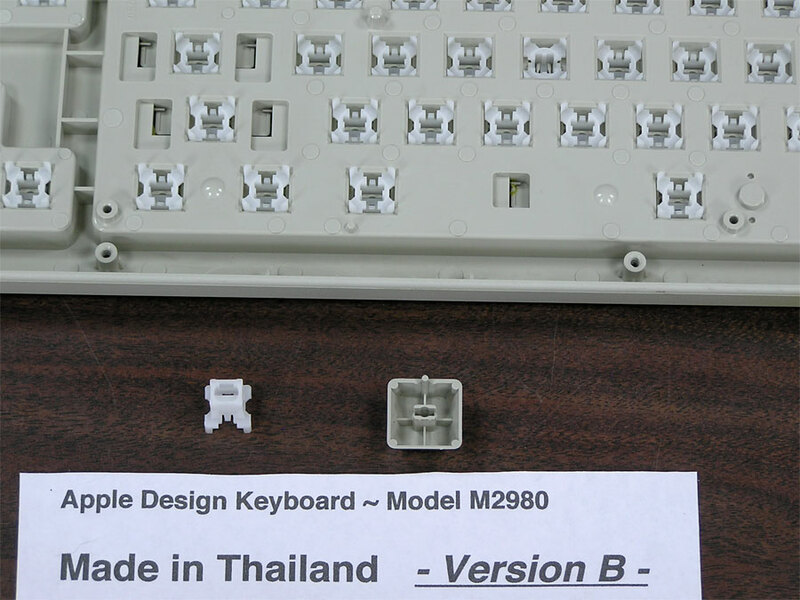 Parts will be selectable at the bottom of this page if they are available, Key Caps for Thailand Version B are found here (Light) or (Severe). Photos above are for illustration only. 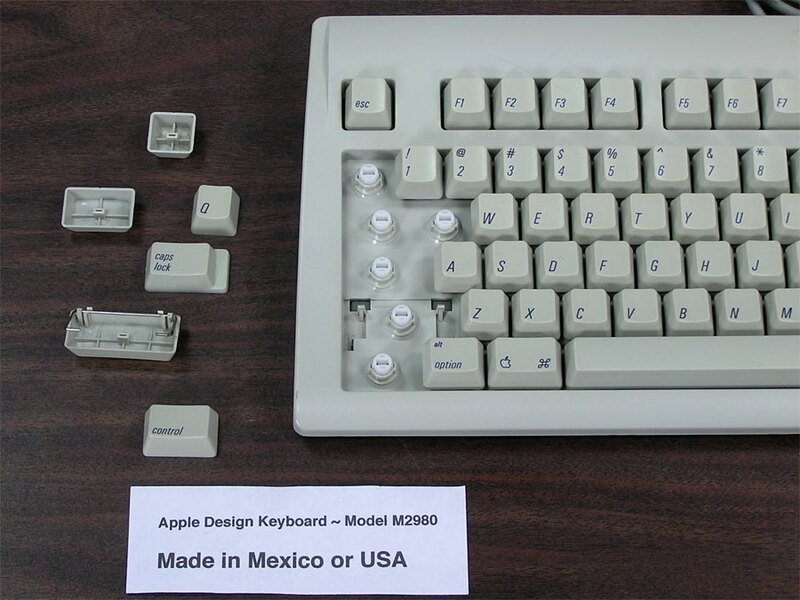 There are 2 keyboards of this version available for parts. One is severely discolored on the majority of the top case, with just a small portion on the right side of the bottom case. 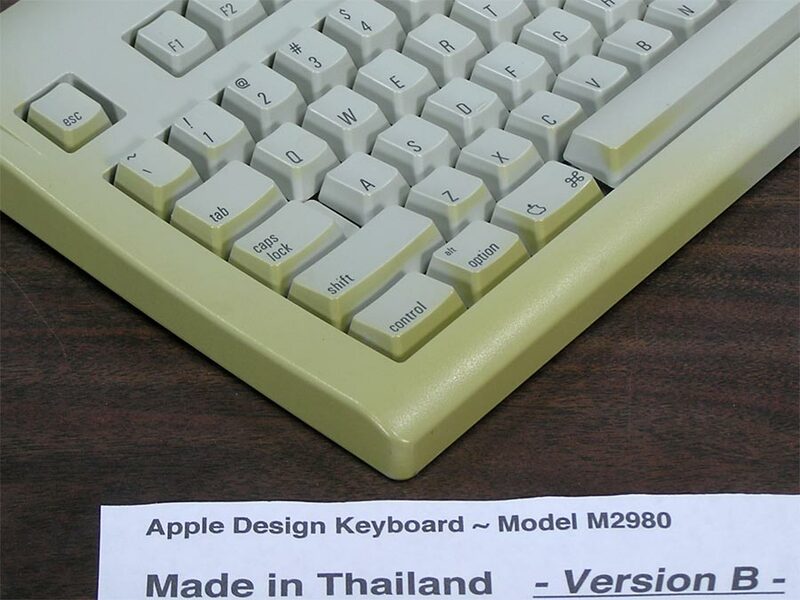 The other keyboard case has severe discoloration on the lower left corner and edge of the top and corresponding right edge on the case bottom. Flip feet are Nice. 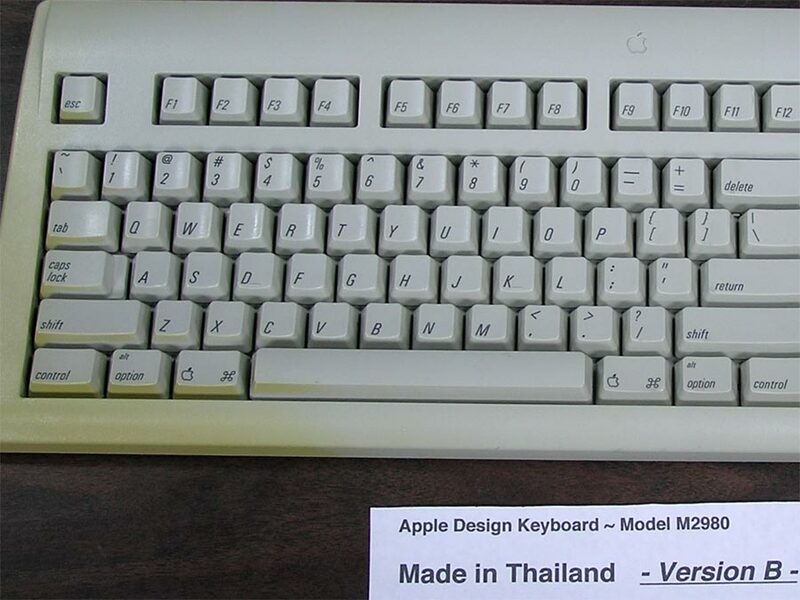 There are two Thailand versions of this keyboard. Both feature long, narrow flip down feet (2). Stamped label on left side. As you can see from the photos, the caps appear to have the same type of post clip on the bottom. 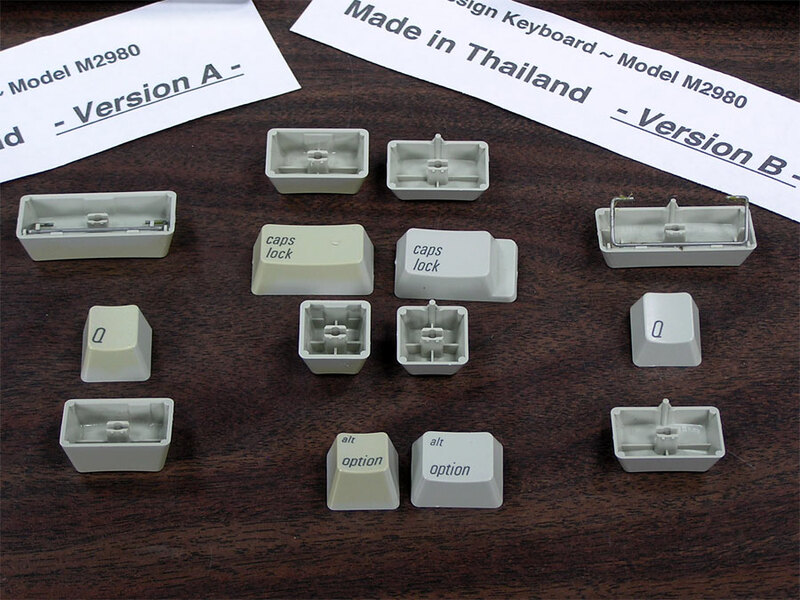 But the posts on the bottom of the caps are different lengths, the key caps themselves are different heights, version B has another post sticking down at the top of each key, the caps lock and option keys are different sizes, and the orientation of some of the switches is different. 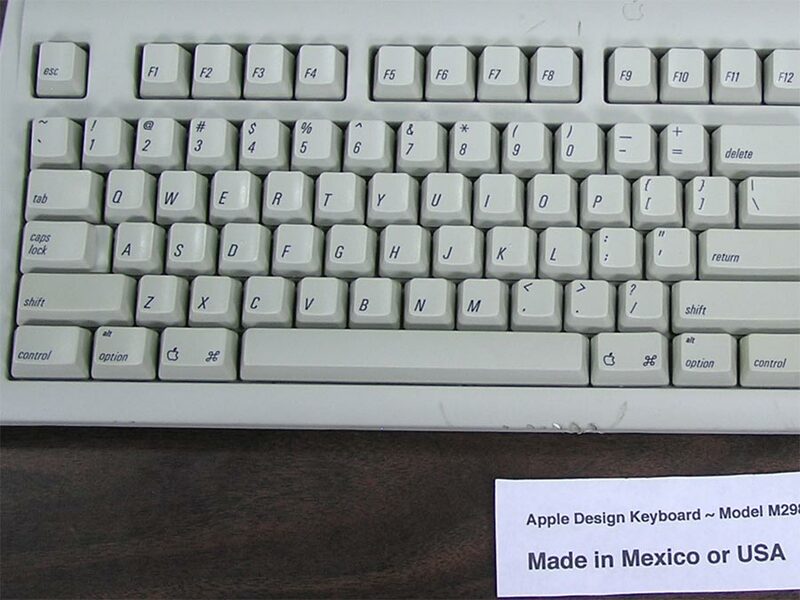 Like the China, Mexico, and USA versions of this keyboard, none of the parts are interchangeable between the versions.